Escape the stresses of university and join us for a relaxing and inspiring retreat especially for Progressive Jewish students! 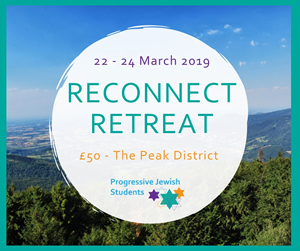 Reconnect gives Progressive Jewish students the chance to come together with friends for a weekend of self-discovery, with the goal to restore and develop the elements of themselves that often become lost or pushed to the side over the academic year. The weekend will embrace Progressive Jewish learning and prayer, examine empowerment and leadership, and explore community and self-care. Highlights include a warm and musical Kabbalat Shabbat, inspiring teaching, and of course a chance to just relax and have fun. Attend with your friends, or come along to meet new people! The weekend will be led by Progressive Jewish Students’ Maya Skaarbrevik (maya@jeneration.org) and by chaplain Rabbi Daniel Lichman (RabbiDaniel@rjuk.org) alongside some other lovely individuals. The retreat is being held on 22 – 24 March, in the Peak District (Nearest train station is Manchester Piccadilly). It promises to be an incredible weekend, so save the date! The cost for the retreat is £50. This does not include travel to the site. (Financial assistance is available and should not be a barrier to your attendance! Get in touch with Maya Skaarbrevik for any more information). Feel free to give Maya a call on 020 8349 5661 or email Maya@jeneration.org if you have any questions!